Curry powder, also known as masala powder, is a spice mixture of widely varying composition developed by the British during the period of British colonial rule in the Indian subcontinent as a means of approximating the taste of Indian cuisine at home. Masala refers to spices, and this is the name given to the thick and pasty sauce based on a combination of spices with ghee (clarified butter), butter, palm oil or coconut milk. 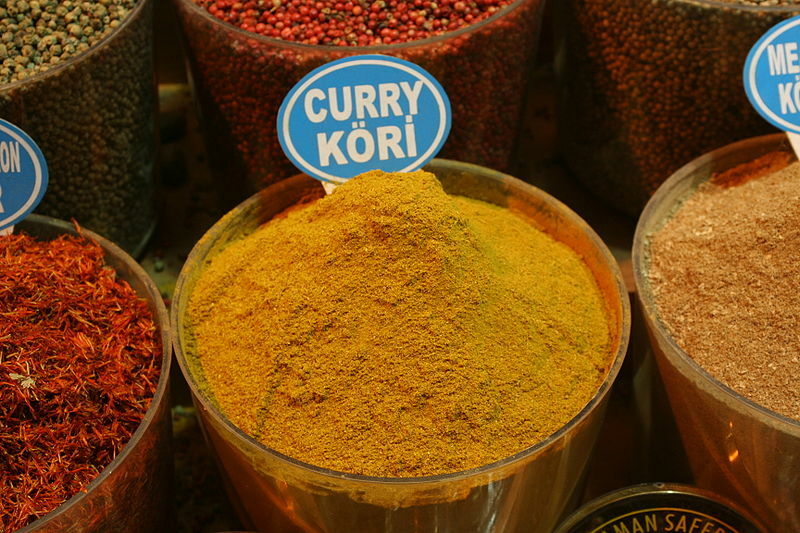 Most commercial curry powders available in Britain, the U.S. and Canada, rely heavily on ground turmeric, in turn producing a very yellow sauce. Lesser ingredients in these Western yellow curry powders are often coriander, cumin, fenugreek, mustard, chili, black pepper and salt. It should be reiterated that curry powders and pastes produced and consumed in India are extremely diverse; some red, some yellow, some brown; some with five spices and some with as many as 20 or more. Besides the previously mentioned spices, other commonly found spices in different curry powders in India are allspice, white pepper, ground mustard, ground ginger, cinnamon, roasted cumin, cloves, nutmeg, mace, green cardamom seeds or black cardamom pods, bay leaves and coriander seeds.